In one of those trips down memory lane (which we really need to cut out if we don’t want to look like old farts) my husband and I spent some time trying to explain The CBS Children’s Film Festival to #2 Son. For those of you not old enough to remember this: back when there were only a couple of channels to watch, it was on CBS on Saturday mornings, after all the good cartoons were over. It was hosted by Kukla, Fran,and Ollie. They think it's Christmas, but it looks like Halloween to me. This was a woman, and two very ugly puppets. Fran was a middle aged (ie impossibly old) woman with big hair. Ollie was… I’m not totally sure. I think he was supposed to be an alligator. But he had fur. And leopard spots. And Kulka was a clown. Apparently they were a throwback to some era when people thought clowns were funny. But to me and much of my generation, they were just baffling and kind of scary. Think King Friday and his lot, but without Mr. Rodgers to tell you that the puppets weren’t actually demonically possessed. 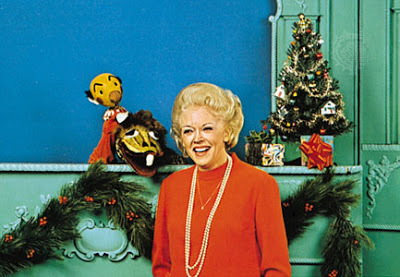 Kukla, Fran and Ollie would chat for a bit, like Sherri Lewis and Lambchop, gone horribly, horribly wrong. And then they would introduce the movie for the week. It was always a “foreign film”. And probably meant to give us culture. The DH and I tried to remember the specifics of these movies, and other than the cold chill down our spines thinking about them, we mostly drew a blank. I remember a Cinderella movie that I loved so much I actually found it on DVD and bought it a couple of years ago. And I think an English movie with a man in a rabbit costume that wasn’t too bad. The DH could remember the one where the two kids built a raft and it capsized and the little girl drowned. I vaguely remember that a lot of these movies seemed to involve kids dying at the end. Or that Japanese one with the fat kid that got bullied, and then his best friend moved away, or he did… It was an endless parade of poverty, orphans, and bullies with a fair number of lost dogs thrown in case we weren’t miserable enough. In short, it was every childhood nightmare I could imagine, plus ugly puppets. I remember turning this on every Saturday about noon, and seeing one of the endlessly rerun slate of movies, thinking about foreign children and the way their fabulous adventures all seemed to end with one of them in a coffin. And then, I was supposed to have a sandwich, and go out to play. Enjoy the rest of your weekend kids! That was the older version of the show, I think. By the time I was a kid, we had nothing but two weird puppets and a whole bunch of depressing foreign films. And I would probably still be scared, because over time, my tolerance for clowns, creepy dolls and puppets has gone down, not up. And clown puppets? I have issues. I don’t deny it. I couldn’t disagree with you more about “Kukla, Fran and Ollie”, and the many, many fans of the show agree with me. First, Kukla was not a clown, and Ollie was not an alligator – he was a dragon. They were not the only characters on the show – there were about a dozen others, and they were so popular that their original show counted Orson Welles and John Steinbeck among their many adult fans. Perhaps as a child you found the show scary, but if you saw it as an adult, you would most likely have a very different opinion. Sounds truly terrifying! Out of curiosity, which country did the Cinderella movie come from?